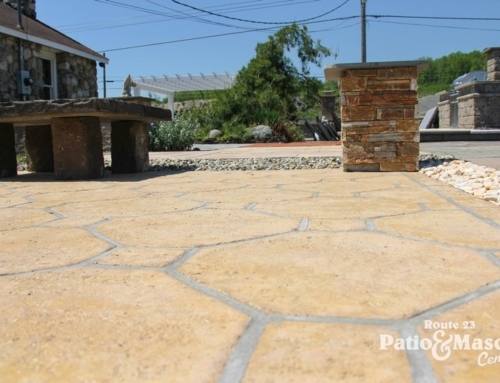 The guys over at Route 23 Patio & Mason Center are dishing their secret recipe for the perfect patio. “It’s not easy, but we’re here for you every step of the way,” says Sean Hughes, the store manager. Most days, you can find him behind the counter at Route 23 Patio helping a wide range of clients from all over the Tri State Area: a carpenter from Sparta, NJ, a first time Do-It-Yourselfer from Warwick, NY, a contractor working on a home in Milford, PA. They all have one thing in common: they count on Route 23’s accessibility, personal touch, and customer service—something you can’t get at a Lowe’s or Home Depot. 1. Call 811 and request to have underground pipes and wires marked so you don’t dig in those areas. 2. Make a plan: decide where you’re putting the patio, its size/shape (keeping it square or rectangular will be easiest), which pavers you want to use, and which pattern you want to lay them in. Find the total square footage of your project so you can figure out how many pavers and how much sand you’ll need (Rte. 23 will help you figure out the right amount). 3. Outline where your future patio is going to be with marking paint. 4. Figure out the slope (don’t worry, this isn’t as bad as Common Core Math). You want the pavers to slope slightly away from your house to help with water drainage. Set a stake at the point on your outline that is closest to your house, and another at the point on your outline furthest from your house. Mark where the height of the pavers will be on each stake with a marker. Tightly tie mason line to each stake, using the line level to measure slope. With every 4 feet, the slope should dip about a half inch. 1. Dig out your project space, accounting for the height of your chosen pavers, PLUS 4 inches of paver base and 1 inch of paver sand. 2. Continue to check your depth against the mason line using a tape measure. 4. Wet the paver base using a hose, then level the base with the hand tamper or plate compactor. Be sure not to step on areas after they’re leveled. 2. Pour in layer of sand over PVC pipe. Use 2×4 to level the sand. 1. 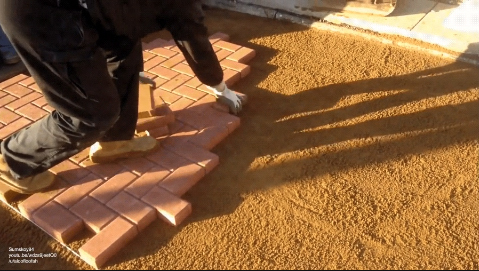 Start in a corner and work your way outward, placing your pavers straight down into the sand, snug to one another. 3. After all pavers are placed, add layer of paver sand over the area, filling the cracks between each paver. Use a push broom to spread it across the patio evently. 4. Use the hand tamper or plate compactor over the area again. 5. Use a leaf blower to get any extra sand off the patio—and you’re done!